Need to add velocity? Improve command? Develop your secondary stuff? Eliminate arm pain? Come to a FBR SAVAGE Training Boot camp. We'll conduct a thorough evaluation and write you a comprehensive and highly individualized training plan that will help you reach what might now seem impossible. When you leave the camp you'll be given a written summary of everything we found, and a day-by-day training plan that will help you add achieve all your wildest dreams. The plan will include your skill work (bullpens/throwing), your movement enhancement work, your strength training in the gym, your warmup, recovery. Call us at 866-787-4533 We can help you customize a plan that works for you. Two-Way Players Can Add On a Friday Night 4 -Hour Bonus Hitting Session! Want to stay with us longer than a weekend? 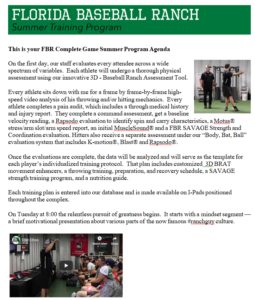 Check out our Complete Game Summer Training Program. 5 hours per day, 5 days per week of the most intense training you've ever experienced! If you'd like to receive an informational packet about our incredible Weekend SAVAGE Training Boot Camps CLICK HERE and we'll mail it to you right away. 21-day individualized multi-dimensional training plan (designed to solve your arm pain and improve your velocity, command, and off-speed stuff) and a 30 day membership to Durathro ($450 value). Download The Complete Summer Program Agenda.